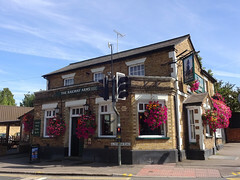 Greene King pub just opposite Bushey Station. The interior wraps around the central bar, with a layout suggesting it was once divided into public and lounge bars, the latter possibly even with a tiny back room. Although it's all been knocked through now, there's still a distinct difference in feel between the two sides. Around the right-hand side from the entrance, wooden chairs and tables and a standard pub carpet offer comfortable seating, while around the other side can be found a pool table, a wood floor, and space for standing. A patio with picnic benches at the side of the pub looks onto the busy road outside. Kake visited on a Thursday afternoon in September 2016. All four handpumps were on, offering Brentwood Golden Galaxy, Mordue Workie Ticket, Greene King IPA, and Abbot Ale. A pint of lime and soda was £1. It was very quiet when I arrived a little after 3pm, and remained so throughout my visit, with just two or three other customers. No music was playing, but the flatscreens were showing Sky Sports with the sound on. According to the 2017 Good Beer Guide, there's a jukebox, but this wasn't in use during our visit. They have free WiFi via The Cloud, which requires registration but doesn't check whether you've used your real email address. Accessibility: A large step to get in. No steps to the toilets, though there are several narrow turns inside the ladies'. Last visited by Kake, September 2016. Opening hours taken from the 2017 Good Beer Guide. Last edited 2017-09-15 18:28:16 (version 2; diff). List all versions. Page last edited 2017-09-15 18:28:16 (version 2).